Pastor Dr. Earl and Betty Sherrick are ordained ministers of the Gospel of Jesus Christ and the founder of Christian Life Center of Pennsville, NJ. 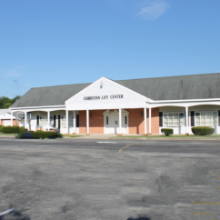 Christian Life Center is a full gospel, nondenominational church founded on the uncompromised Word of God and His love. John 10:10. Dr. Sherrick is a graduate of Southeastern University, Lakeland, Florida and received an Honorary Doctorate of Divinity Degree from Saint Thomas Christian college, Jacksonville, Florida. Dr. and Mrs. Sherrick have pastored churches in West Virginia, Missouri, Massachusetts, California and came to New Jersey from Tennessee. By direction of the Holy Spirit, God speaking to Pastors, they came to Pennsville to establish the Word of Faith Church in 1977. Pastor has traveled in over 50 nations of the world preaching the message of God’s love salvation through the death burial and resurrection of Jesus Christ – how to live by faith, and His soon return. He is also the International Director of Pastor’s Partners. This partnership by prayer and financial giving’s enables Pastor to fulfill this area of his calling. Serving with her husband throughout these years, Pastor Betty has ministered faithfully with him, loving people and teaching the Word of God. God has blessed the Ladies of Living Grace keeping the Word alive in so many hearts.